Looks like Mcdonalds will have ponies this year for the 25h anniversary? I hope so... I have a brother who works there maybe I can get him to get me a set or two if they do!!! That would be coo. 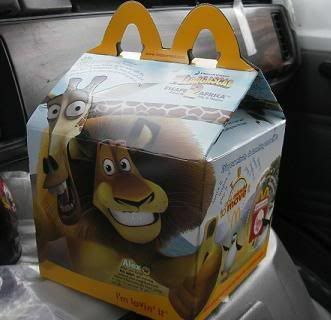 I would like to see the older ponies in the happy meals. Maybe. It doesn't seem like they do ponies lines very often, and since they just had the Ponyvilles not too long ago, I don't think they will. It'd be cool though! They had the Ponyville McD ponies in March 06, and the ones before that were what '04 or 03? I can't quite remember. Two years might be enough time to have more, and that would be awesome! But I already know there would only be 7 toys. Am I right? A little Core 7 humor for you... .or not! Haha! 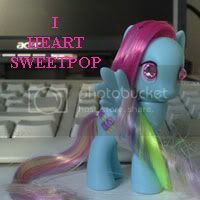 Hasbro is releasing LPS Mcdee toys, maybe mlp toys are right behind them? 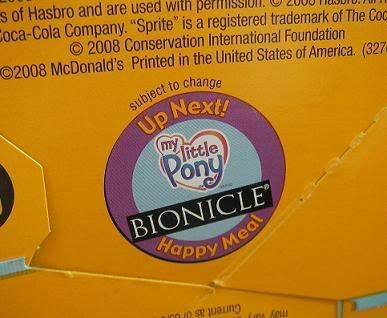 That would be cool if Mc Donalds released mlp toys again. But I already know there would only be 7 toys. Am I right? A little Core 7 humor for you... .or not! Haha! SO not funny you evil PONY!!!!!!!!!!!!!!!!!!! hahah :lol: , Actually 7 would be good, I think there were only 4 over here when we had them last time. Hasbro rep today at the fair said they are going to do a set of 6 exclusives with a 'resteraunt they've worked with several times before', in the fall, so I'd assume this is McD's they are talking about; they haven't really done anything with any other resteraunt that would be nationwide. But 'exclusives" implies actual items, not just little cheap happy meal toys! They could still be called exclusives, since they are "exclusive" to the particular restaurant chain..
Id say your speculation could well be correct, since the only other toys have been once of Taco Bueno..... and a drinking cup at Chucky Cheese. Edited to add: Silly me... I didn't read page 2! Sorry for the repeat. I should really sign off & go to sleep, lol. At the fair today, the Hasbro crew said there would be an upcoming release of 6 toys at a "fast food restaurant which they had partnered with in the past". I guess for some reason they were not allowed to say "McDonald's", but that is the only US restaurant that it could be. Also this means there would be a release before the end of 2008 because they could not talk about any definate plans for 2009. Oh guyssss.... your speculation has become a reality!!!! Check it out! I was out in the field for work this week, and on the way home today stopped at McDonald's. Looks like we'll be having MLP as the next toys. The current session of toys is for Madagascar 2. So the next question is, what do you think they'll look like? Ponyville again like March 2007? :cheshire: Yipppeee!! I'm hoping for little plushies. Something different than silly plastics. ACK!! That means I'll have to make trips to McD's, blech! But I guess worth it for MLP'S. I hope for ponyville without the annoying bases being attached or little stuffies! That would be cool! * I do like their new iced coffee's, it's great for when I travel!